Sam Palumbo is a former linebacker in the National Football League. He was drafted in the fourth round of the 1955 NFL Draft and played two seasons with the team. During the 1957 NFL season he played with the Green Bay Packers and later was a member of the Buffalo Bills of the American Football League. 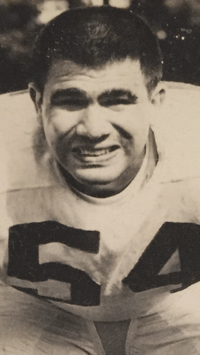 Although he suffered a shoulder dislocation diving for a fumble in a game against the Green Bay Packers in October 1955, Palumbo played in the NFL Championship Game on December 26, intercepting a pass in the second half of the Browns' 38-14 victory over the Los Angeles Rams. As a student-athlete at The University of Notre Dame, he was a college roommate of Regis Philbin.